Recorded at the famed Funkhaus Berlin, All Melody is as much about the process as it is about the output. He's no stranger to conceptual albums, but Frahm put aside any overarching idea for his latest album and concentrated on the physical feeling that sound can produce, and as such the album is indebted to its surroundings and its instruments. Frahm spent the better part of two years building out Saal 3, originally designed for recording chamber ensembles, and transforming it into his instrument of dreams. This context is essential in understanding All Melody; as a standalone piece, it works beautifully. Live performances were designed to recreate Saal 3, to impressive effect, which further highlights the album's intricacies and Frahm's multilayered approach. But this is an album that begs to be lived with and experienced, one that continuously evolves over time and puts Frahm's virtuosic abilities front and centre. Konoyo is Tim Hecker's 'adult' album — but one of those fascinating weirdo adults, like one you'd see in a Derek Jarman film. On his ninth full-length, the Montreal-via-Vancouver experimentalist traveled to Tokyo, assembling a gagaku group of musicians before writing the album's seven striking compositions in a Buddhist temple. The resulting LP finds Hecker pulling apart his regular layered noise, instead delivering simple and extremely affecting pieces that resemble warped and reassembled classical suites. In addition to his gagaku ensemble, Hecker also brought in keyboardist Kara-Lis Coverdale, cellist Mariel Roberts and experimental electro artist Ben Frost to help helm the boards, making sure his Eastern excursion didn't become to a carbon copy tribute. But Konoyo is much more than its backstory suggests, as Hecker seems utterly set on exposing the raw beauty of each tone, each sound. Konoyo never sounds arranged or prescriptive…just fascinating. Weirdo adult fascinating. It's astounding that Jean-Michel Blais elevated his neoclassical compositions to such soaring highs on Dans ma main. What were once spacious and swelling cascades of notes on Il are here complemented with very subtle synth incorporations (an influence, in part, from working with CFCF on their EP Cascades last year). His ability to build beautiful compositions layer by layer through varying cadences, pedals and some stellar dynamics gives "blind" life, while the subtle darkness of "roses" belies some rather interesting influences: Rachmaninoff, Eric Carmen and Radiohead among them. As the piano gently twinkles on "sourdine," the ambiance evokes a stroll through the neighbourhood in the wee hours. There's something that this album nails with its tone, intimately capturing the vulnerability and sobering thoughts that often come out at night. Dans ma main is characterized by a certain calmness, letting thoughts wander to create a wholly unique musical vision. An incredible step forward for Blais, it showcases the best that Canada's neoclassical vanguard has to offer. Intimate never sounded so good. 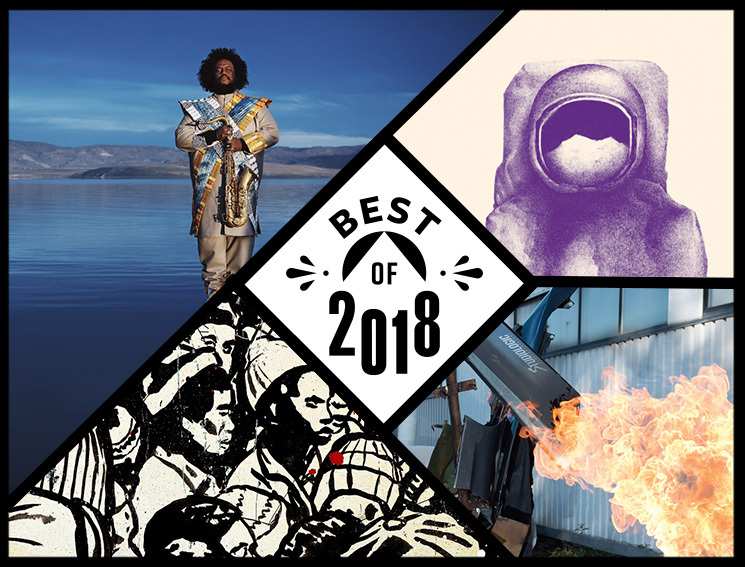 Widely hailed as a modern saviour of jazz upon the arrival of The Epic, Kamasi Washington's Heaven and Earth is no less ambitious — maybe even more so — than its predecessor. Nearly a half-hour shorter than the aforementioned 2015 LP (if you don't include the near 40-minute, five-track bonus disc The Choice), Heaven and Earth is a testament to how engaging jazz music can be under the direction of a bandleader with no shortage of ambition for the expanded format. Washington's decision to split the album into an Earth half ("The world that I am a part of") and Heaven half ("The world that is a part of me") provides both a rewarding conceptual contrast and a more manageable way to take in the sounds of Washington and his exceptionally talented cast of collaborators. The songs on Earth play more brash and bold, felt immediately on opener "Fists of Fury." Washington's riveting rework of the Bruce Lee movie theme finds him giving a stunning solo before vocalists Dwight Trible and Patrice Quinn declare, "Our time as victims is over. We will no longer ask for justice. Instead, we will take our retribution." On the flip, Brandon Coleman's vocoder on "Vi Lua Vi Sol" and the closing one-two of "Show Us the Way" and "Will You Sing" highlight Heaven's melodic flights of fancy. "When you bring the songs back, you're gonna bring the dances back. You're gonna bring the people back. You're gonna bring everything back." Sampled from a conversation with his elder Maggie Paul, that sentiment is both the subject and object of Jeremy Dutcher's Polaris Music Prize-winning Wolastoqiyik Lintuwakonawa ("Our Maliseet Songs"), a genre-defying collection that breathes new life into traditional songs he accessed through archival recordings of his ancestral Wolastoq community in New Brunswick. Those recordings are often woven directly into the fabric of these new compositions, as Dutcher's soaring, operatic tenor duets with the voices of his ancestors while modern instrumentation flows freely. On album opener "Mehcinut" ("Death Chant"), Dutcher's cascading piano is led to a reverent march by a persistent snare drum, while brushed drums and a double bass dance all over the coda. "Essuwonike" ("Trading Song") exchanges propulsive scenes of dance-y, baroque-inflected folk song for stabbing pianos and the ecstatic cacophony of crashing cymbals. The album climaxes with the expansive, swirling drama of "Pomok naka Poktoinskwes" ("Fisher and the Water Spirit"), Teiysa Kasahara's whooping soprano joining the action before the track reaches its pounding conclusion. As accessible as it is ambitious, it's a beautifully rendered collection that reaches beyond generations and traditions to create music in dialogue with time itself, transcending the white noise of popular modernity and propelling culture into the future on new wings, building a legacy that's only begun to take shape. Wolastoqiyik Lintuwakonawa is a brilliant, vital undertaking that demands to be reckoned with.